Look for the little neon wolf! Lupino, the new bistro and bar from Becco alums Richard Lodge and chef Marco Lori, opened on Wednesday. 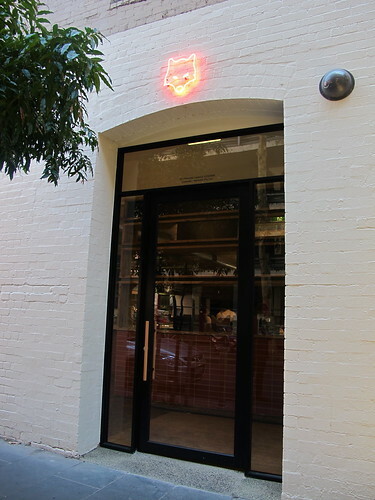 It's located at the top end of Little Collins Street in the site formerly occupied by the Champagne Lounge, next door to Bar Lourinhã. Lupino means 'little wolf' in Italian, so it's only fitting that a neon wolf cub's head marks the venue entrance. The interior is trattoria-casual: lots of orange tiles, wicker-backed chairs, an open kitchen and nary a starched tablecloth in sight. The menu is pretty short and snappy, including bar snacks and antipasti, half a dozen pasta dishes and a few more substantial secondi. They also have a wonderfully minimalist pizza menu (Margarita or Prosciutto or Garlic & Rosemary or Anchovy), which warmed my "pizza: less is more" heart. 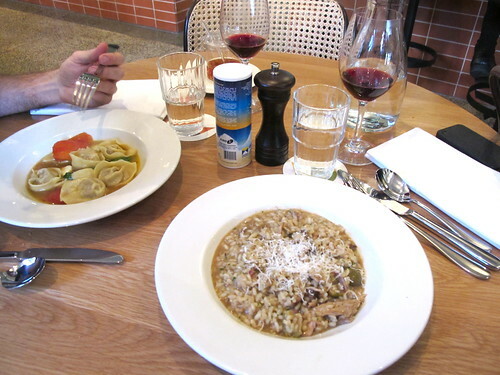 When I dropped in for lunch on Thursday with my Sydney friend J, he ordered the veal tortelloni with fresh tomato, bocconcini, basil and brodo ($22). I had an excellent risotto of rabbit, porcini, pancetta and green olives ($24). A glass each of Devil Bend Creek Pinot Noir sealed the deal. 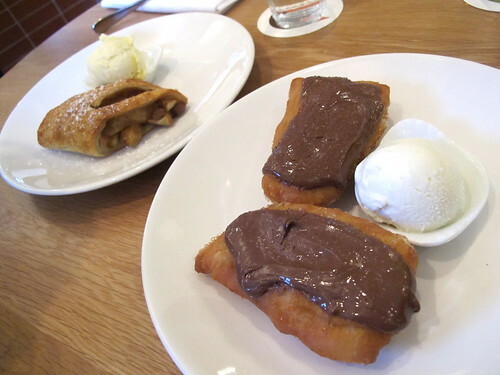 J loves apple and pastry, so ordering the apple strudel ($14) was a given. He loved it. My eye was caught by the promise of bomboloni with imported Italian Nutella ($14, and yes, the difference in taste for the imported stuff is noticeable). HOLY HELL they were epic, both in terms of size and the generous slatherings of Nutella. They tasted damn authentic though, like the ones I used to buy when I lived over in Italy. The scoop of slightly sharp yoghurt ice cream was a nice touch. But play it smart and share this dessert with another person. Or if you're feeling brave (and don't need to go back to the office afterwards), order the Scroppino - lemon gelato and Prosecco with a shot of vodka. 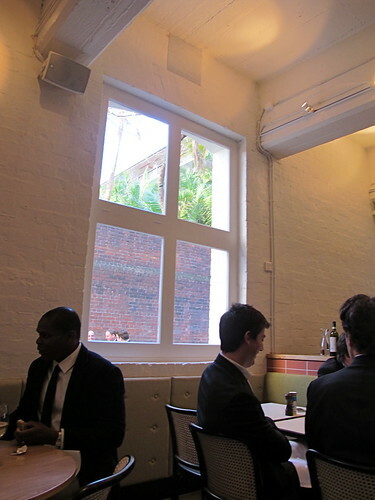 The windows looking out over Ridgway Place, offering glimpses of the Melbourne Club's tropical Secret garden. This corner of the CBD just gets better and better: as well as Lourinhã you've got Danny and Siany at Liaison (happily, now a regular coffee haunt of mine since I started my new job), Mamasita, and - coming soon - San Telmo. 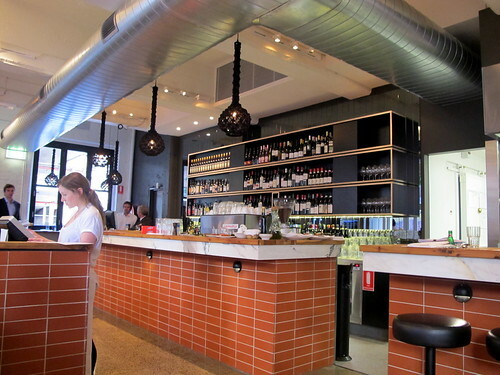 San Telmo is the Argentinian restaurant that Jason McConnell (from The Aviary, and cousin of Andrew and Matt) is going to open in Meyers Place, once the fancy-pants custom-made grill manages to make its way over here on a boat from South America. 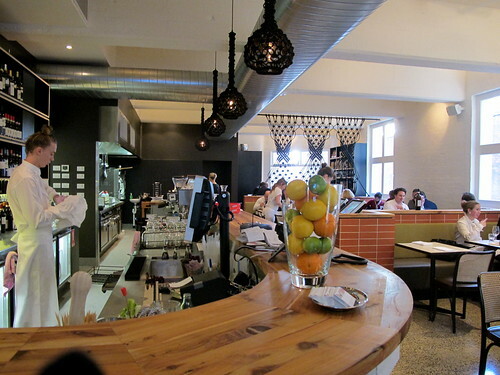 Quietly hoping San Telmo will be Melbourne's Porteño! 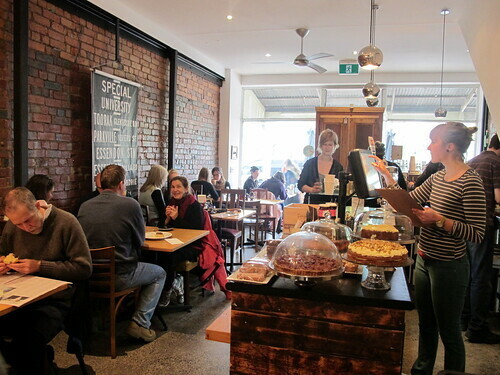 Gypsey & Musquito may have been dead for 185 years, but their names live on thanks to a new cafe on Bridge Road, Richmond: a street where for every brunch hit (eg Bosisto's, RHCL) there are several misses. Gypsey & Musquito, however, is definitely a hit in my book. 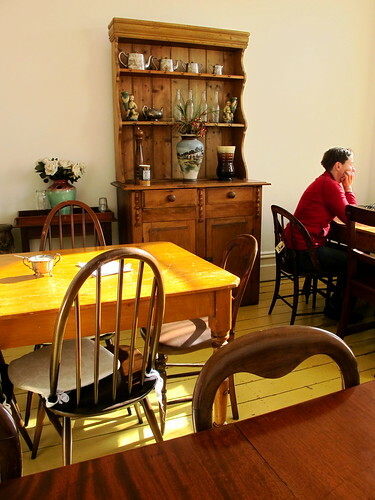 The fitout is cosy and homely, especially the upstairs dining room which features colonial furniture and lots of natural light. 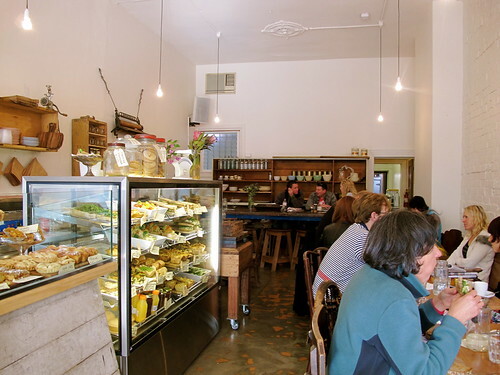 In keeping with the name and upstairs decor, cafe owners Kirrily Stewart and Anna Ingle have given the menu a very Australian flavour, with almost all of the dishes including a native Australian ingredient. Forget about those awful 1990s tourist restaurants serving dodgy quandong pannacotta - here, the use of native ingredients is much savvier and the effect is far more organic and pleasant. 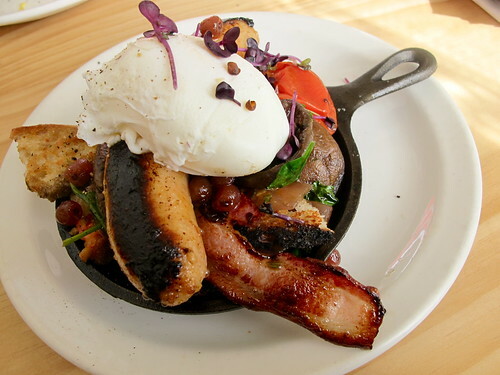 When I went there a few weekends ago with my gentleman friend, I braved the "breakkie skillet" ($16): a wee, cast-iron pan crammed with crispy bacon, tomato, field mushrooms, torn pieces of toast (that went slightly soggy from the juices of the other ingredients, like in a panzanella) and native riberry confit, topped with a crocodile sausage and a poached egg. Loved those tart little riberries! 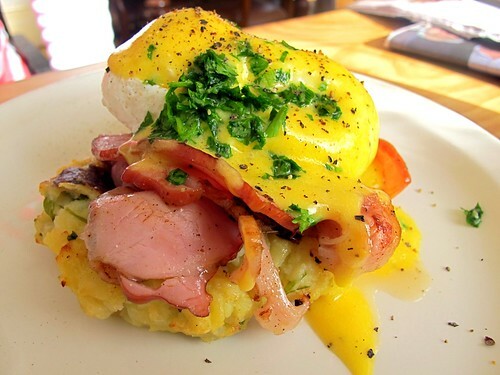 He had the potato and herb hash with crispy free range bacon, poached eggs and a luridly yellow lemon myrtle hollandaise ($14), and reported back favourably. The coffee (Five Senses on a Synesso) was also good, and if I'd still been hungry I'd've accompanied it with a moist-looking quince tea cake or lamington. Oh, and there's free wifi, too. Add it to the list! 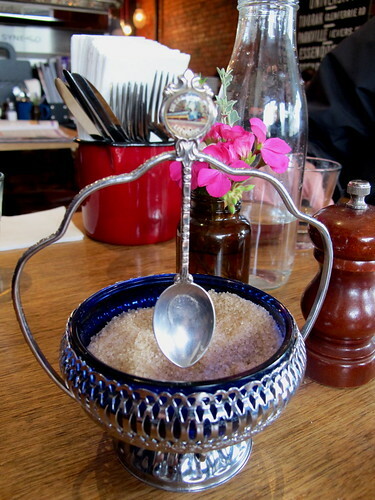 A few weeks ago I met my two best friends, b-f-K and Schatzi, for brunch up in Brunswick. 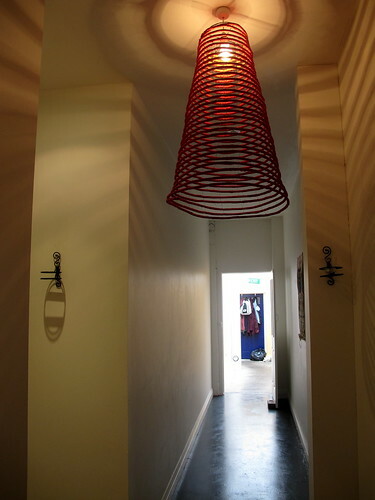 We were accompanied by the latter's husband and two year old son, and selected Miss Marmalade as our destination on the basis of Schatzi's description of it as cute, cosy and child-friendly. The coffee is Five Senses (on a Synesso machine, natch) and the all day breakfast menu is joined by a light lunch menu from midday. We're also talking single origin teas, La Madre bread and Green eggs. 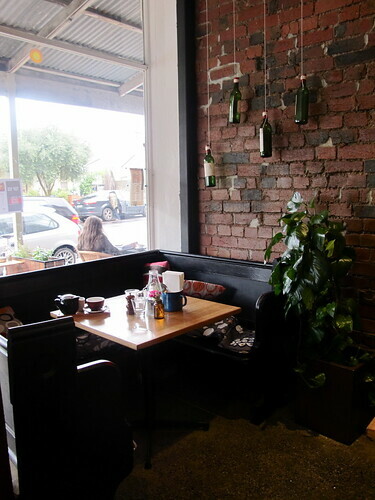 We managed to score the prized corner booth in the window, which afforded us a good view of the busy cafe interior. 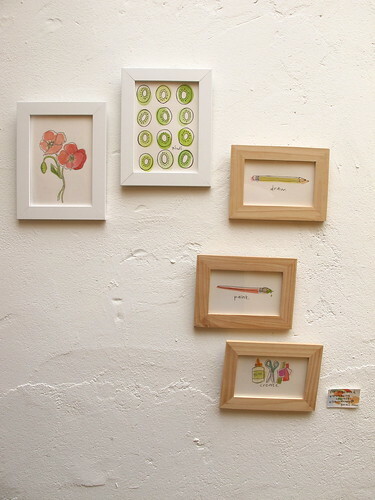 Love the tram scroll on the wall! Both Schatzi and I ordered the huevos rancheros ($14.50): rather than traditional corn tortillas, there were two sweet corn fritters topped with a fried egg, roast tomato salsa, guacamole and a side serve of sweet hots. My kind of brunch dish: the corn fritters were not at all doughy (as can often be the case), and those pickles were mouth-wateringly good. 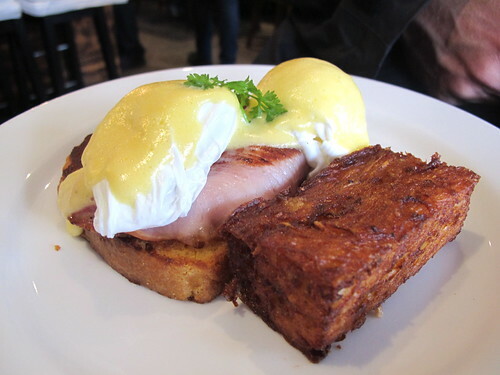 Schatzi's husband ordered the eggs benny, which came with leg ham off the bone, homemade corn bread and a formidable-looking brick of hash browns ($15.90). 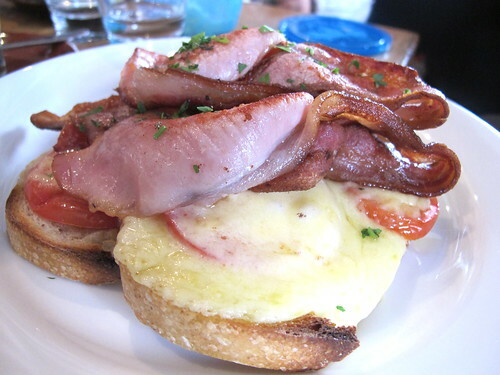 B-f-K went with the Jacks cheddar on sourdough with vine-ripened tomatoes, rosemary and bacon ($12.90). Both reported back favourably on their dishes. 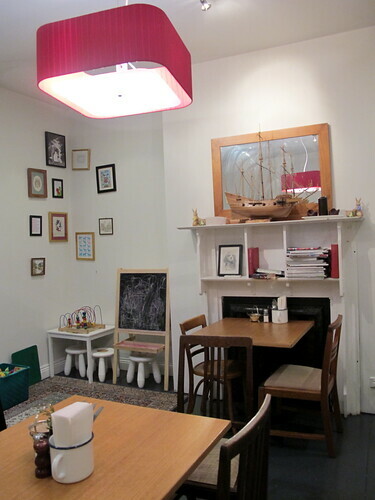 The back room at Miss Marmalade is kitted out with toys and children's furniture, making it a great place to bring groups of kids. Parents' groups, take note! It's not something I've had to really be conscious of in the past, but given that Schatzi has just had another baby (yay! 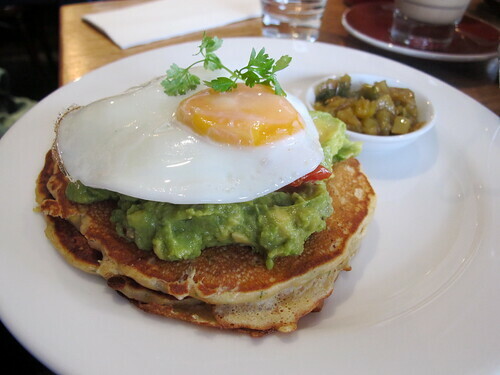 ), can anyone recommend other child-friendly - but good - brunch destinations?